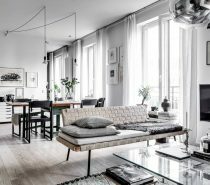 Be inspired by the simplicity of these three modern Scandinavian style homes, each beautiful in their own fresh and interesting way. 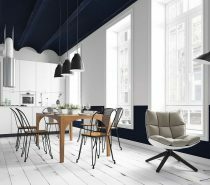 Through this trio of tours you will find cool Scandi style furniture and accessories, fresh minimalist decor ideas and super clean home layouts for modest sized home interiors. 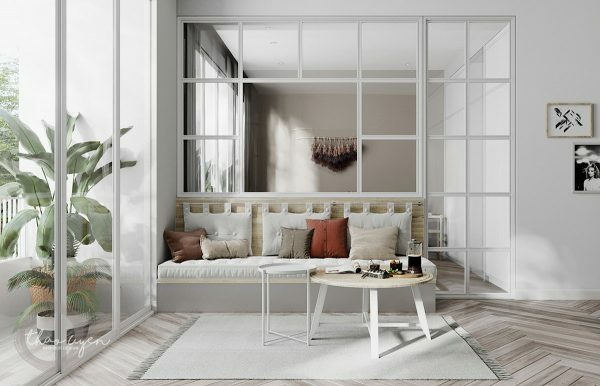 Our first home delivers a botanical theme through living greenery, which is teamed with brown leather accent furniture and strong black base notes. 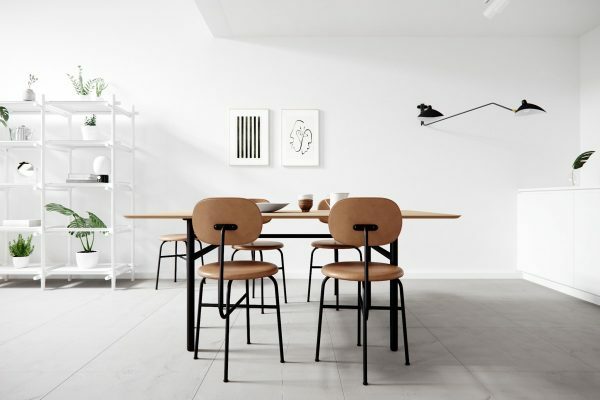 The second place is the ultimate minimalist Scandi situation with just a hint of muted colour. The last is a rosy interior designed for a little family unit, featuring kid’s bedroom decor looking pretty in pink. 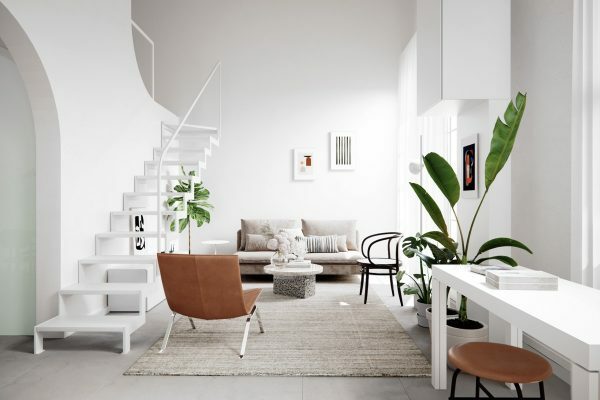 A peaceful plain white scene is painted in the Scandinavian living room of home number one. The ice white backdrop is decorated by just a few small examples of wall art to make the space feel loved and lived in. 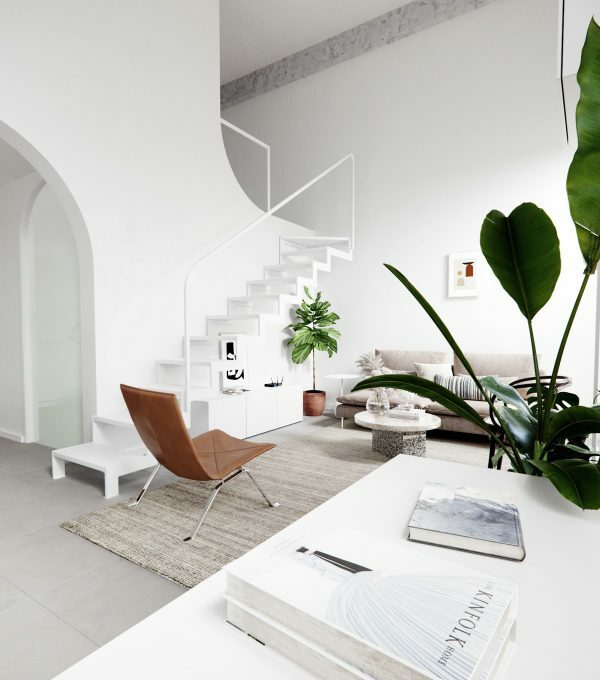 An open tread modern staircase design runs up one side of the double height room, with a metal balustrade drawing a thin white line. 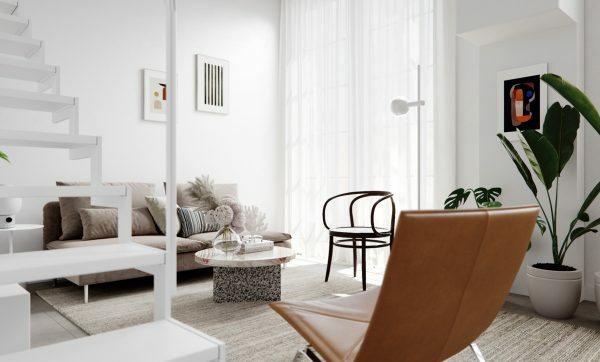 Brown leather accent furniture anchors the light and airy decor scheme. 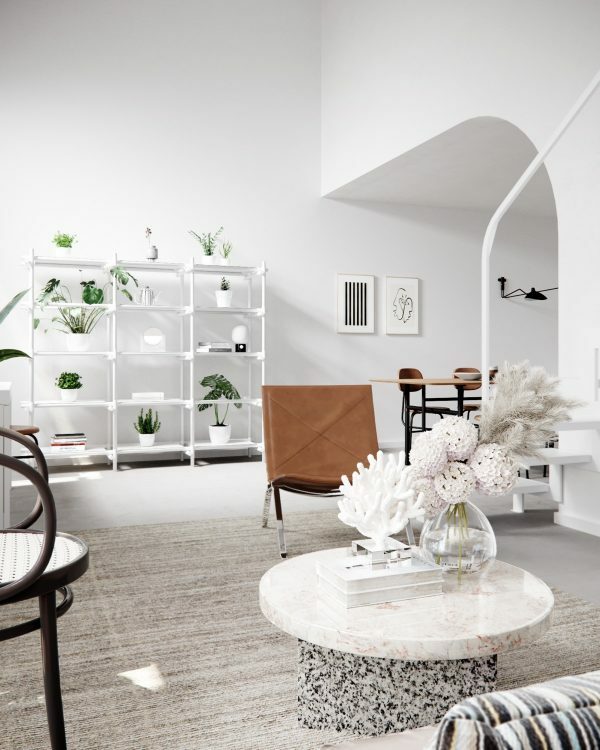 A neutral rug defines the lounge from a home office area. 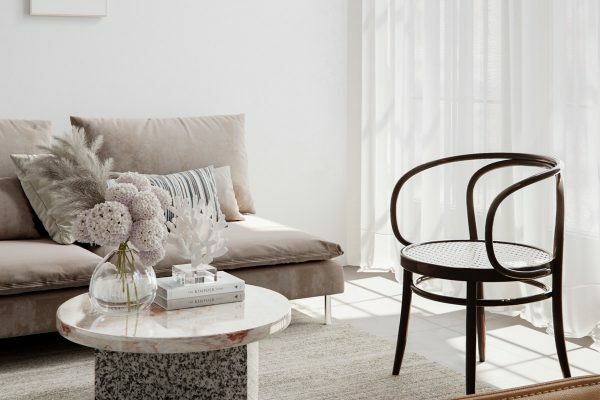 A two tone marble coffee table takes up its spot in the centre of the living room, binding the monochrome and brown elements of the room together in one piece. Beside the compact two seater sofa stands a small side table. The table lamps here are the Menu JWDA. A dark accent chair joins the sofa and brown leather chair to make up a modern three piece suite of sorts. 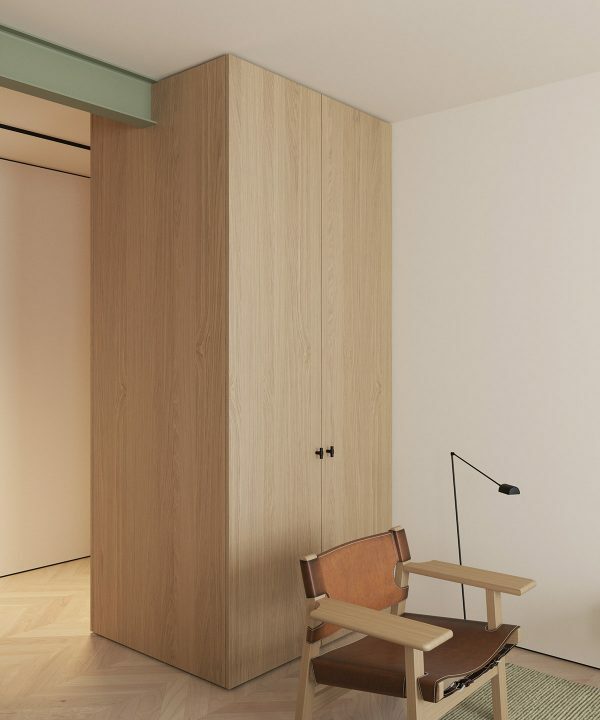 The open back chair lets natural light from the window shine through into the centre of the room unobstructed. The living room is an L-shaped layout; a dining room is seated around the corner from the small lounge layout. 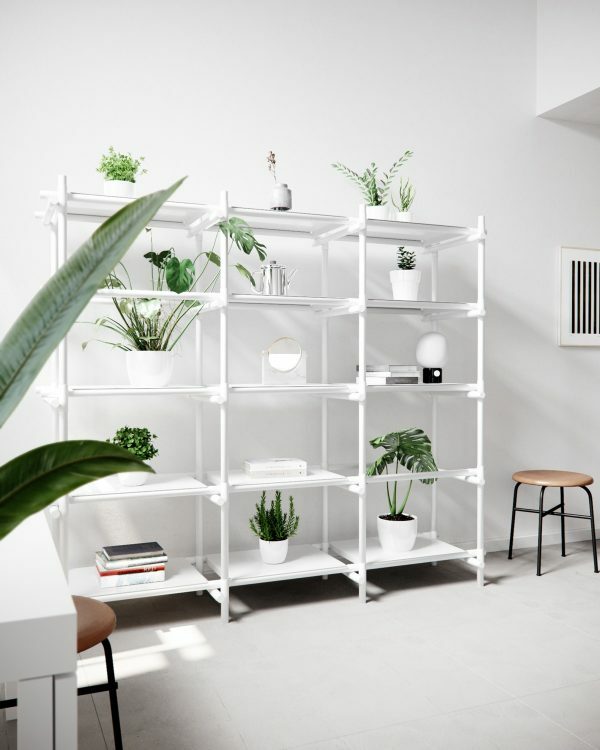 A white shelving unit holds an array of indoor plants in the transition space between the lounge and dining areas. A silver watering can joins the botanical display. Simple directional lights illuminate the eating area. 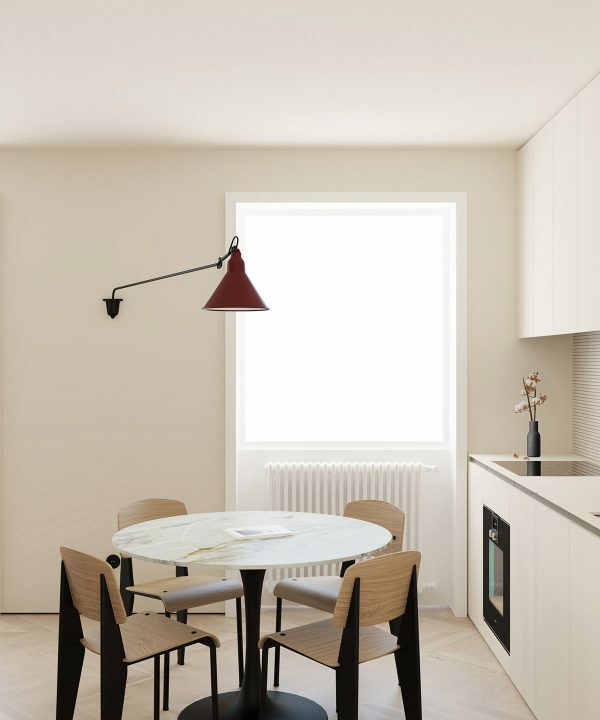 In the kitchen behind the modern dining set, the swing arm wall lamp is a Serge Mouille. 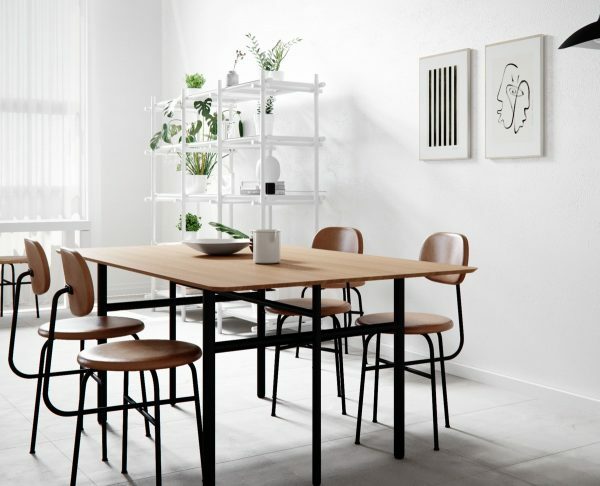 Monochrome wall art decorates the rest of the white backdrop in the minimalist dining room. 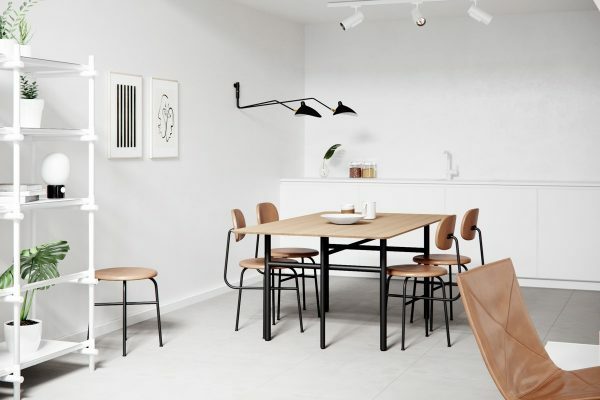 Rich brown upholstery and black metal legs give the sparse dining decor some weight. 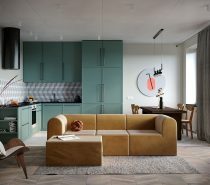 Located in Copenhagen, Denmark, our second Scandi style home has an area of 66 square metres, most of which is allocated to an open plan minimalist living room. 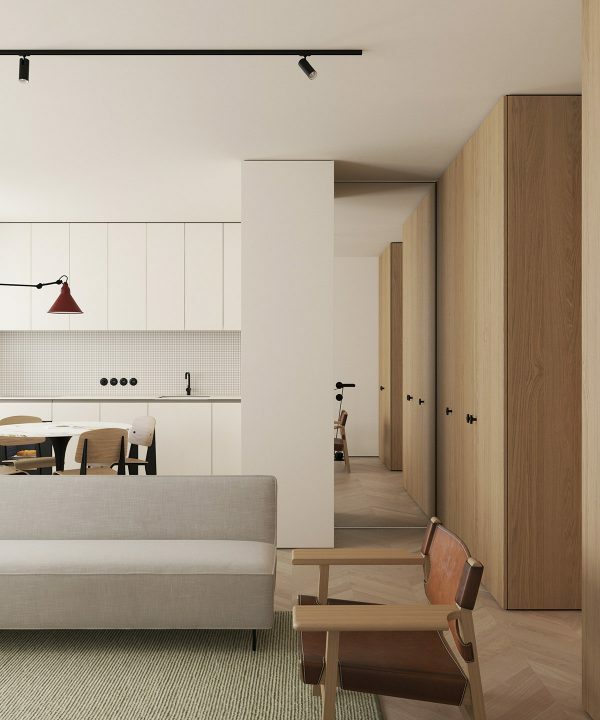 A full length mirror helps to visually increase the sense of space inside the compact apartment. 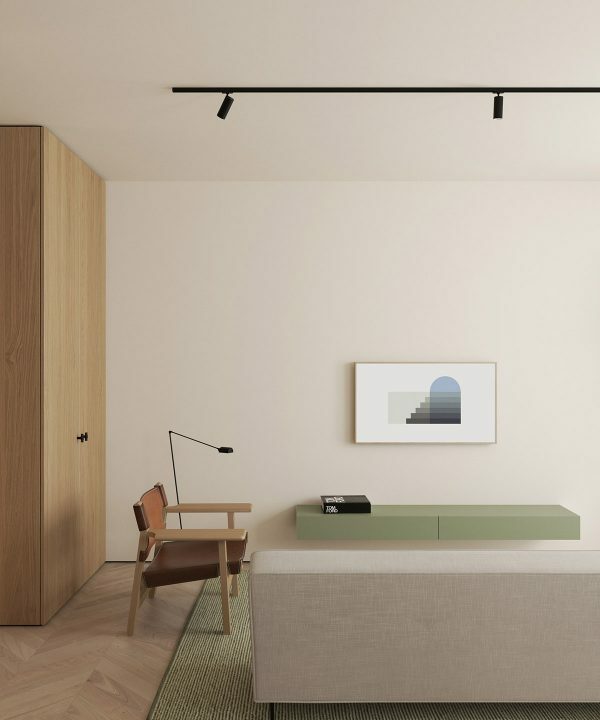 Pale sage green, tan and wood tone colour the pared back design of the living room dining room combo. 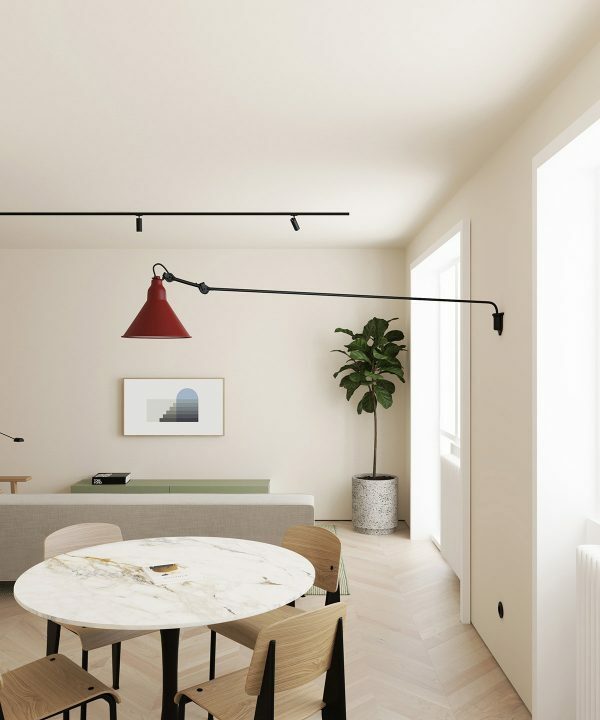 A wall light brings in an unexpected dash of red over the dining table. 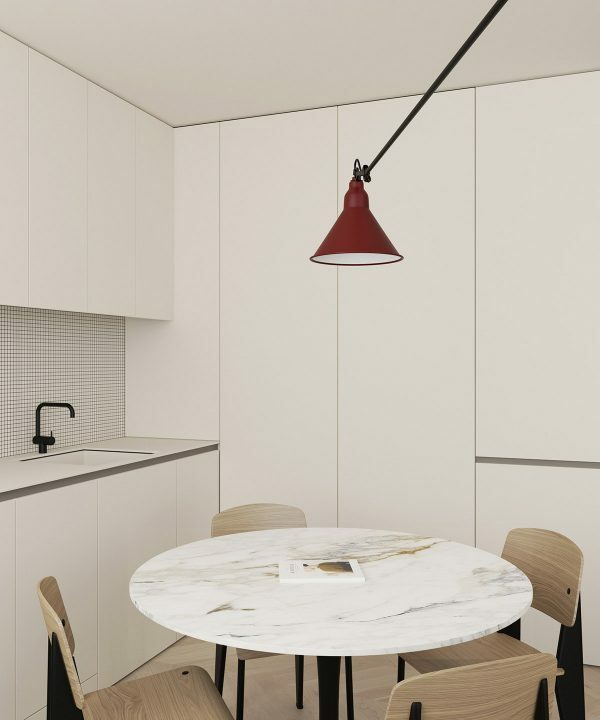 The dining table is set with a round marble top and is teamed with modern wood dining chairs. 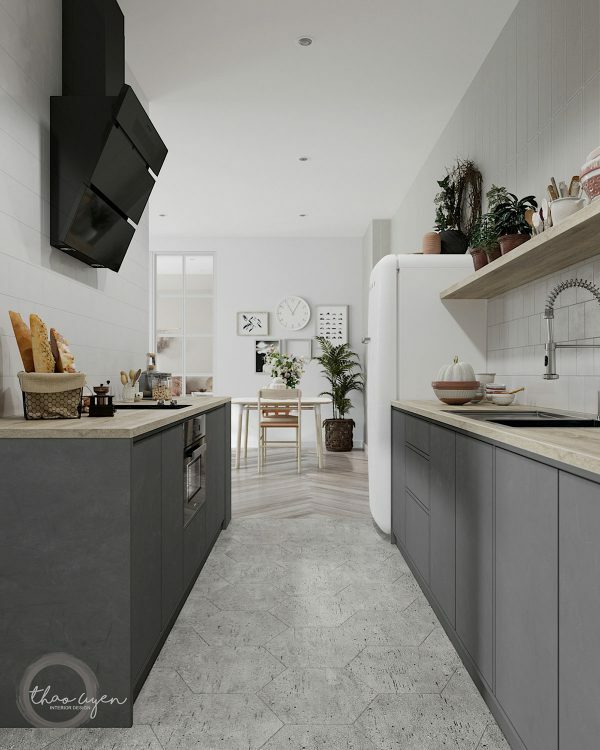 The neighbouring kitchen has white cabinets to match the pale tabletop, whilst black integrated appliances and a black faucet draw out the dark tones of the dining chair and table legs. 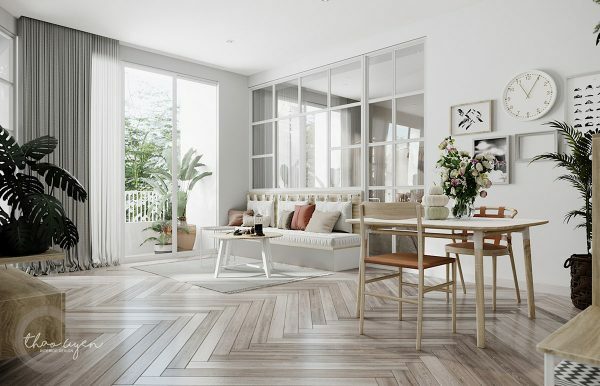 An au courant herringbone floor runs throughout the open plan living room and on into the hallway. 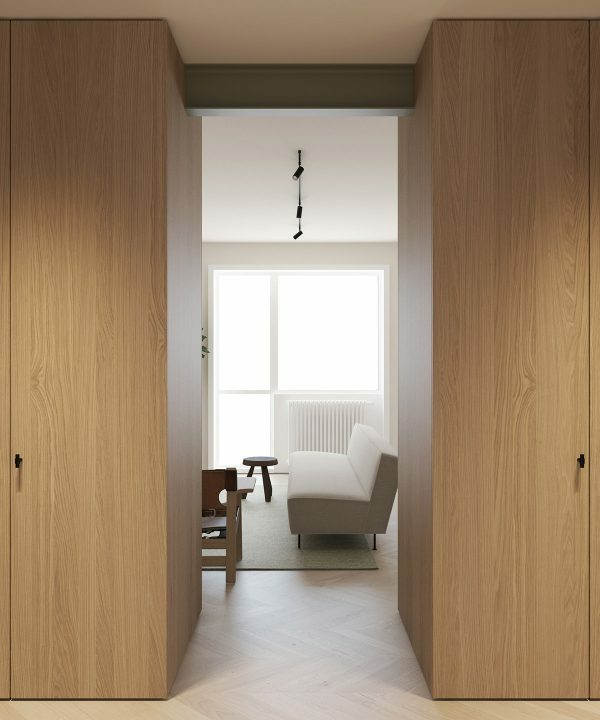 Bespoke storage cabinets create a divide between the living room and home entryway. 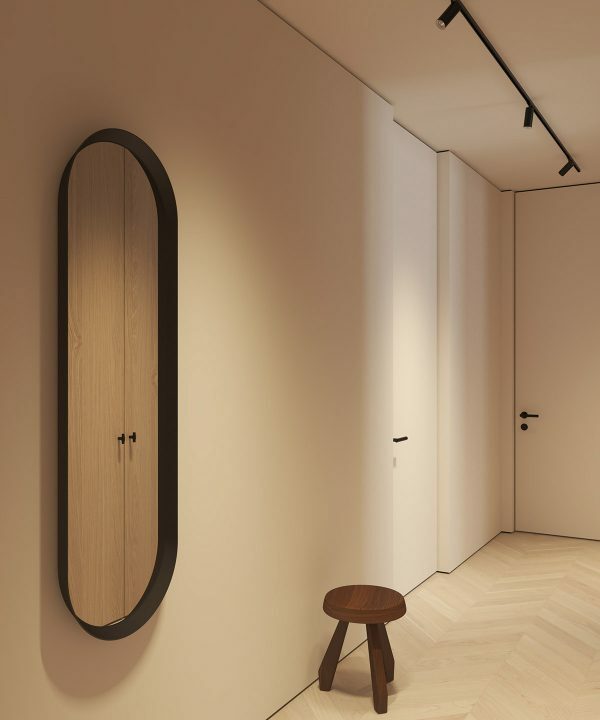 The full length mirror in the room also serves as a dressing mirror by the closets. 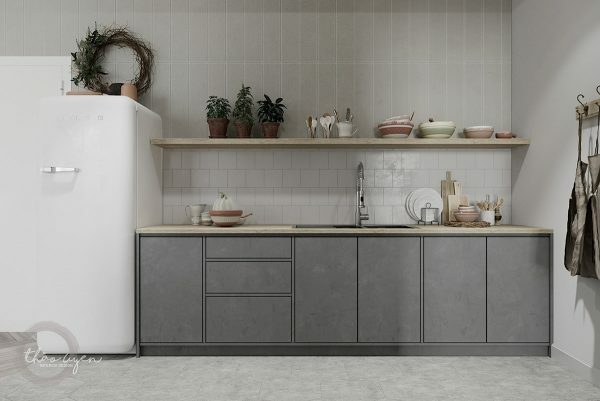 The storage volumes offer cabinet space accessible on either side. 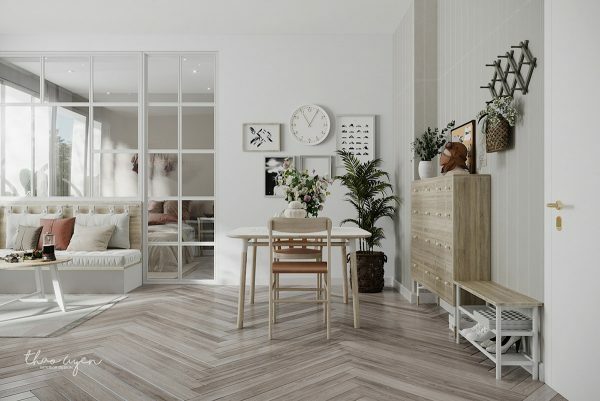 Scandinavian styled home number three has a slightly stronger herringbone design floor, which incorporates a larger variety of shades. A purpose built sofa is built into the space between a window and an internal door, with a rail added to hold up backrest cushions. A neat area rug and a set of nesting coffee tables dress the lounge. Shoe storage shelves and a chest of drawers rest against the wall by the entry door on the other side of the compact room. 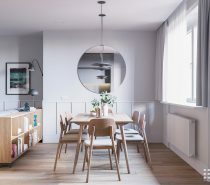 A dining table for two stands less than a metre away from the hallway storage units, but a large indoor plant provides a visual divide between the two uses. A small gallery wall with clock also assists in painting the dining area as its own spot. A cluster of decorative vases provide the tabletop with a pretty floral centrepiece. Around the corner, a grey galley kitchen runs off the dining area. 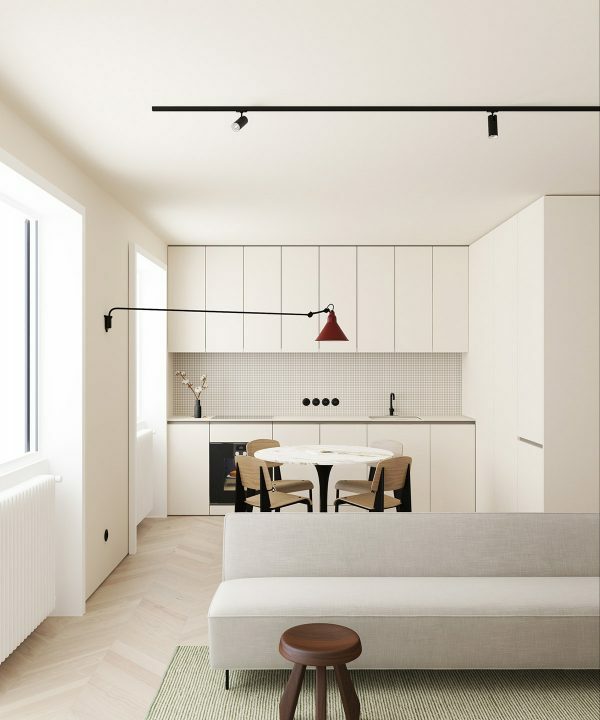 Hexagonal floor tiles give the space just a taste of geometric modern flavour. 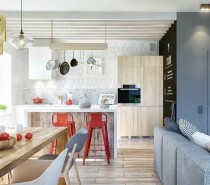 Wooden countertops crown the grey and white kitchen, along with a stretch of open kitchen shelving. The master bedroom has a boho vibe, with knitted tassels strung above the bed. 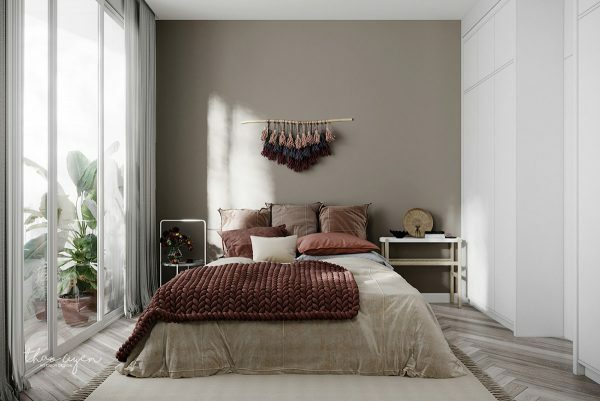 Bedlinen in rosy tones teams well with taupe decor. A chunky knit bed throw creates a wonderfully inviting soft, warm and cosy look. Rosy hues continue in the kid’s decor too, as does the beautiful herringbone design floor. 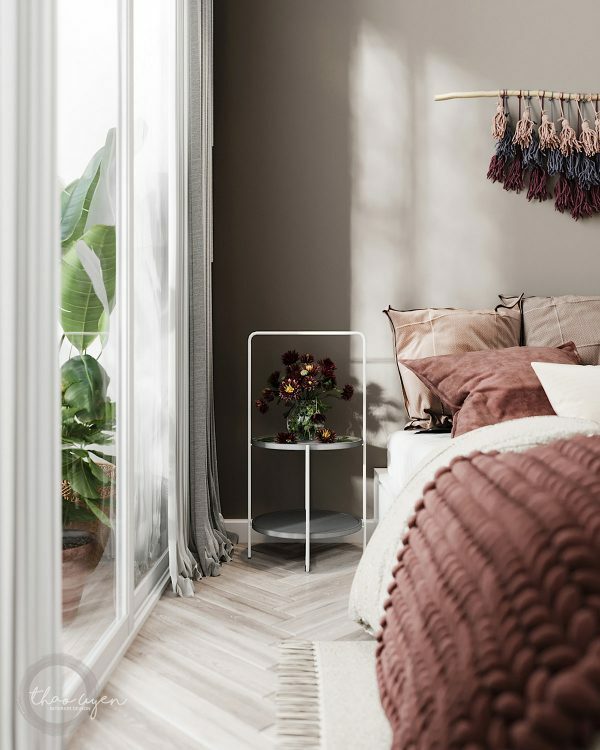 A textured pink feature wall stretches all the way up to a high ceiling, where a sheer canopy is attached to a trapeze swing-style mount over the bedhead. 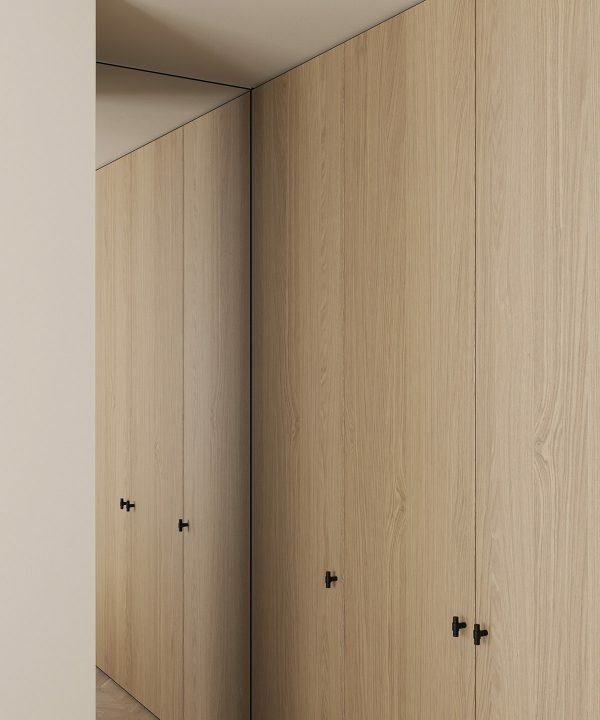 White wall cupboards run above white closets to make the most of the generous vertical proportions, and provide maximum storage space for the youngest member of the family. An attached open shelving unit allows the child to display their favourite things. 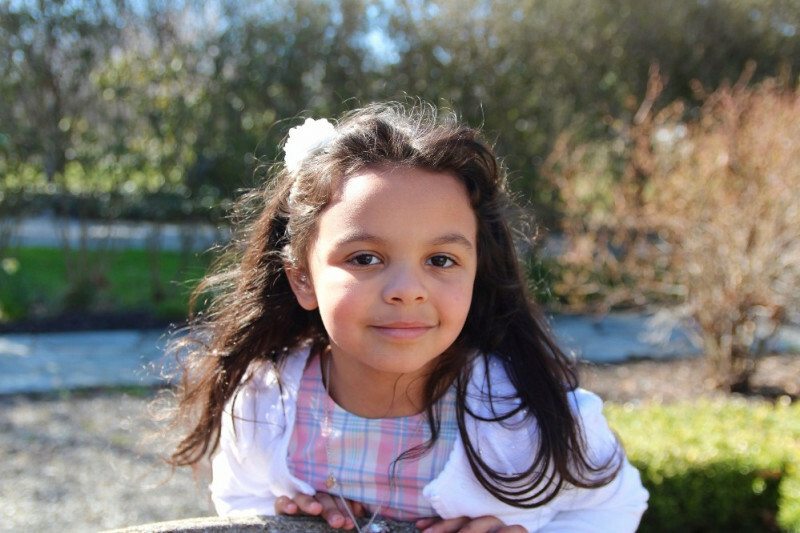 A teepee pet bed has been sewn to match the child’s room, and given a home by a pink star shaped rug. 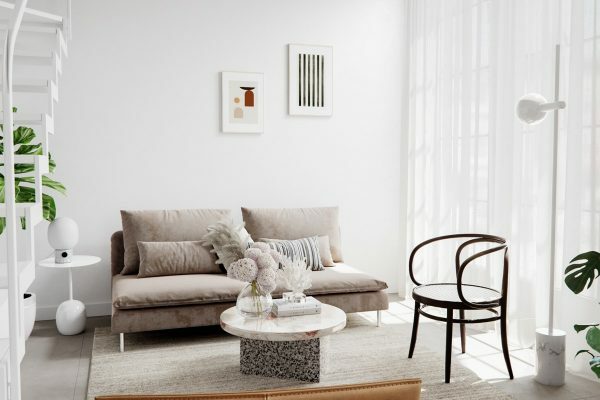 Monochrome toy baskets and boxes pepper the rest of the space to balance out the sweetness of the candy pink tones. 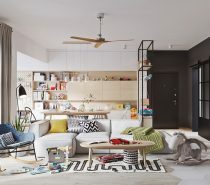 House shaped shelves build a miniature city of display nooks opposite the foot of the kid’s bed.